Bicol is famous for its magnificent tourist spots and breathtaking landforms like the Mayon volcano which is recognized for its almost symmetrically colonial shape. Bicol is also famous for its people. Bicolanos are characterized by their hospitality and courage, hence the term “oragon”. Aside from this, Bicol is also known for its native delicacies. It offers a wide variety of cuisine which covers every taste and gives satisfaction to the people’s craving. Bicolano dishes are often characterized as spicy, because of the frequent use of chili pepper in their dishes, and “magata” (bicol term for rich in coconut milk). The Bicol express and Laing are the most famous among these dishes. But aside from these dishes, there is one dish that is especially known only here in Naga City. It is called kinalas. 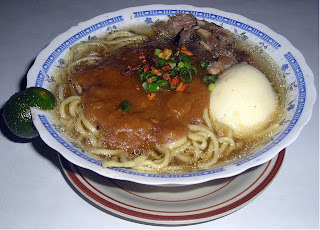 The kinalas is a flavorful noodle soup which is similar to the mami. Its noodles are cooked in a broth of a skinned pig’s head until the meat and flesh came off. That is why it is called kinalas. It has a special brown sauce that looks like the sauce of a Pansit Palabok and it is topped with meat slices that came from the pig’s head. It is best served hot and often eaten along with egg slices, spring onions and chili pepper. To suite your taste, you may add fish sauce (patis) and calamondin (calamansi). The kinalas is often paired with banana cue or baduya. Kinalas is usually served in carinderias and eateries . Although it may seem that many will not be in agreement with the place’s cleanliness, one will not mind anymore because of the flavorful and savory taste of this dish. It is not just any ordinary soup because when people get to taste this dish they will consider it as one of their comfort food and they will surely come back for more. In Naga city there are four (4) eateries that serve the best kinalas. Some of these carinderias are Twin Kinalas found in Dayangdang Street and Cely’s Kinalas in Barlin Street. It is the most densely-populated city in the region, and is locally known as the "Heart of Bicol". It is the commercial, financial, educational, religious and cultural center of the Bicol region. Residents of the City are called Nagueños. Naga City is at the core of Metro Naga, an unofficial designation given the city and 14 municipalities in the area administered by the Metro Naga Development Council. MNDC covers the entire 2nd district of the province of Camarines Sur, and part of its 1st, 3rd and 4th districts. And Naga is popularly known in Bicol as the Maogmang Lugar. Kinalas is a noodle dish similar to the everyday mami except for a topping of what looked like a Pansit Palabok sauce, and the meaty dark soup made from boiling a cow or a pig’s head until the flesh fell off. Hence, the name kinalas. Kinalas / Luglog, just like the tagalog word "kalas", refers to the "fall off the bone" meat that is placed on top of the noodles.The soup is the broth of beef bone and bone marrow ( sometimes skull and brain included) or what Manileños call "bulalo". Kinalas and log-log are noodle soup dishes served bicol style. The noodles is cooked in a flavorful broth of a skinned pig’s head with a very special browny sauce. The soup is topped with very tender meat slices that also came from the pig ‘s head. This is great when served piping hot with an egg, sprinkled with roasted garlic and spring onions. You may also add kalamansi and patis to suit your taste. Kinalas is usually paired with Baduya / Banana Cue or Camote Cue. Kinalas / Luglog, just like the tagalog word "kalas", refers to the "fall off the bone" meat that is placed on top of the noodles.The soup is the broth of beef bone and bone marrow ( sometimes skull and brain included) or what Manileños call "bulalo". Kinalas is popular in Naga City and usually served in a carinderia or turo-turo. The place will not usually pass the usual health and sanitation standards, but life is short, the kinalas is Oh So great! Carinderia and eateries in other places offer a Kinalas variation but the best is in Naga City. it was also said that Cong. Dato Arroyo, son of PGMA is a big fan of the Kinalas.The best Kinalas in Naga City can be found in: Cely’s Kinalas, Barlin Street and Kinalas Twin, Dayandang Street and Enting's kinalas along Diversion Road. So what to do? try it now!! blogARTbypadua,intia,carandang. Ethereal theme. Theme images by borchee. Powered by Blogger.